The following services are on offer at Kersbrook Equestrian Centre. Once you've had a look around please let us know how we might best tailor services to suit your needs. Nicki Stuart is an experienced an instructor who will help you to bring out the best in your horse and develop your skills and confidence. You will first improve your position through exercises on the lunge if necessary. Then Nicki will work with you to tailor a training program based on your goals and skill level. Incorporated in all lessons are the principles and application of equitation science. This humane, sustainable and efficient training system builds in an understanding of how horses learn and works with the horse's natural behaviour. It successfully addresses problem behaviours such as separation anxiety, shying, bucking, and transportation difficulties. If you are horseless, or would like to refine your riding skills, you can have lessons at the Equestrian Centre on our schoolmaster. Cosmic is 16.1hh Warmblood and has been with Nicki since 2001; they successfully campaigned in dressage. Comic is a calm and well educated mount. These lessons are subject to rider evaluation and availability. The minimum age for students is 12 and the weight limit is 80kgs. We do not cater for beginners. If you are unable to travel with your horse, please enquire about home visits. Nicki can also help you to start your young horse correctly, or take it in for intensive re-education. Here are the current lesson fees, which may be subject to change, and all new clients will need to bring these completed forms to their first lesson. Kersbrook Equestrian Centre hosts clinics with world renowned trainers, Dr Andrew and Manuela McLean. Through their hands on application of equitation science the McLeans have revolutionised the way we approach equine learning and training. Dr McLean has a PHD in Equine Psychology and competed at an international level in eventing, show-jumping and dressage. Manuela incorporates their methods and a keen interest in rider biomechanics into her dressage training. Their books and accompanying DVDs are available exclusively in SA at Kersbrook Equestrian Centre. Download registration form. If you are looking for a venue for your next clinic, rally day or small show you can't go past the facilities on offer at Kersbrook Equestrian Centre. The indoor arena is only available for day hire on one day of any weekend. Would you like your horse to have solid foundations for future success? How about the opportunity to work hands on with your horse through its foundation training? If you're about to start your young horse's education you of course want the best possible outcome, and a foundation that will ensure future success - whatever your riding interests. When learning theory is applied to horse training the consistent results are horses that are calm and obedient. There is no confusion, and the training is error free. This logical, progressive system gives all horse owners a reliable, efficient training toolbox and will enhance your relationship with your horse. While your horse is here for training you can attend as often as you like. The pace and length of the training placements will be sympathetic to the individual horse and your personal situation. If you're a rider who appreciates top class facilities and a professional, horse-centred approach, then agistment at Kersbrook Equestrian Centre offers everything you and your horse could require. Horses are kept with company in large paddocks with natural features. Our amenities are extensive, safe, and user-friendly. 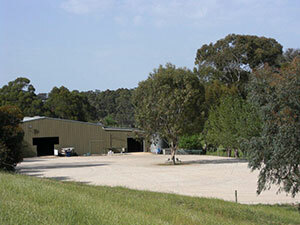 Our rolling paddocks have excellent pasture, ample shelter and the safest electric fencing. The full-care agistment package includes supplementary feeding, the use of all facilities, and discounted lessons. The property also has access to riding trails through the adjacent Mt Crawford Forest. Our resident manager will ensure your horse has the best daily care. There's tack & float storage, a warm water wash bay and a washing machine for the use of all residents.